So I'm so sorry for not posting in the last month... Since we seem (well most of them are me) to take lots of random pictures we have a plethera to post in the last month. Enjoy! I went to pick some veggies at the garden and Grandpa Farr said he would watch Mckenzie while I was out there. I came back in to find her fast asleep! So cute! We bought a new car! YEAH! Long story short our little Nissan was beginning a long line of repairs so we traded it in (after it died on us going to trade it in). 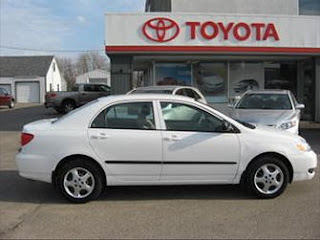 We bought a WHITE (Jordan's favorite car color) Toyota Corolla. He wished it was a truck but we are happy with what we have. Mckenzie playing Maria from the Sound of Music! haha SHe takes after her mother. Rolling the ball with Mom and Dad is one of her favorite things to do. Sorry this is sideways- but she was having so much fun playing with her shoes! Kenzie laughing while eating... so much fun. Probably one of my favorite pictures I have been able to get in action. Jordan would point at Kenz and she would reach out like ET and touch his finger! So precious. She doesn't like the texture of some foods and she makes the cutest faces! Just Mommie and me playing with the camera. I was so tired when Daddy picked me up and I just fell right back to sleep! At Los Hermanos for Clints and Porters Birthday... obviously I had to wear a sombrero too... They even sang Los Hermanos style! Jed and Porter enjoying the Guacamole! In Manassa for the Parade. It was so fun to be at home! Mckenzie got the good spot in the shade. She just chilled while some little boys stole all her candy. You got to be quick! A picture of me finishing the 5k in Manassa. Yeah! Who pays money so they can run? Silly but lots of fun! Kj, Holli, and Kenzi How cute! Daddy and me watching Mommy cook dinner. So this is another face she loves to make. Her little pouty face. We would tell her it was time for bed and this is what she would do. We took Mckenzie swimming... hahah we decided to let her ride a ducky like a good cowgirl. haha I think she liked it. She loves to swim! WEll that's all for now. More pictures next week! Great Pictures! She is growing so fast! Looks like you've had a great summer! That little girl is so cute! I'm glad you guys have her :) hope everything is going well for you!!! I love all the summer pics! Kenzie is a doll! We are moving next week for Michigan, I'm kinda sad, but at least I have a nice house to look forward to! I'm sad I never saw your baby girl! =( Keep in touch!